Here are our top picks for the best stereo speakers for home audio that provide a really crisp music experience. These stereo speakers are designed to provide crystal clear sound performance with detailed separation between the right and left channels for you to distinguish between each individual note. Furthermore, these speakers come equipped with durable rubber surrounds and high performance acoustic drivers with wide frequency ranges to allow you to pick up every single detail in the music. They are mostly 2.0 sound systems which provide separation between left and right speaker channels, although they can also benefit from an additional subwoofer. If you are looking for one of the best stereo speakers at any budget that can produce great sound, be sure to check out our top picks below! The Polk Audio T15 are some of the best stereo speakers that provides crystal clear music performance with Polk Audio’s exclusive Dynamic Balance Drivers and tweeters for wide response and low distortion. It features rubber driver surrounds that improves frequency response and improves durability. It also comes with magnetically shielded enclosures to eliminate any static distortion which you might get from exposure to nearby audio wires. We liked the fact that the T15 stereo speakers are sonically-matched speakers designed to work together in synergy to deliver a fully integrated stereo performance with good separation and detail. The speakers come with dynamic balance silk/polymer composite tweeter with neodymium magnets delivering a lush, balanced soundscape. Furthermore, the speakers are relatively easy to setup and supports Dolby and DTS, allow them to form part for your home theater listening experience. Overall, the Polk Audio T15s are some of the best stereo speakers you can use for home audio installations and we highly recommend them. The Polk Audio T15s deliver crystal clear sound performance with crisp highs, detailed midranges and deep bass response. With Acoustically-inert, furniture-grade MDF, the speaker is capable of producing solid sound with clearer details and reduces resonance and distortion. We liked the fact that you can easily crank up the volume on the T15s to maximum without hearing any distortion from the upper frequency ranges. The T15 has bright highs, wide-open mid-ranges and even a surprising bass response, giving a good kick for instrumental and vocal music genres. The T15 also has no difficulty working together with other speakers in a surround sound system. It works great with giving a great surround sound system in a medium sized room as frontal or dialogue speakers. The bass that comes with the T15 is decent but not overwhelming – it’s a 2.0 system that requires an additional subwoofer to supplement the lower frequency ranges. 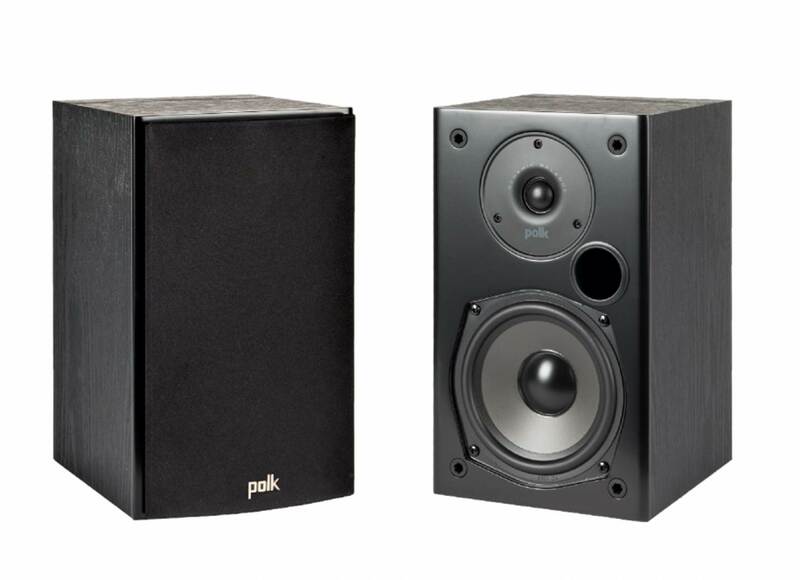 The Polk Audio T15 is well-constructed and build to last for a long time. The cabinet box is made of acoustically-inert, furniture grade MDF which helps to reduce resonance and distortion. The designers of the T15 have also thought about the various setups of this system, and sonically matched the speakers to work in a synergistic manner with balanced response across all speakers. The T15 can also be placed upright against the wall for better bass resonance, thanks to the design being compact and front ported. The magnetically shielded enclosures also help to prevent any static interference when the speakers are placed near audio cables or wiring. The speakers look really sleek with the solid MDF enclosure and blend in nicely with modern home interior décor. The Verdict? The Polk Audio T15 is one of the best bookshelf speakers designed to integrate into a surround sound system and works great as bookshelf speakers. The speaker is capable of deliver crisp highs, detailed midranges and tonal bass which make them enjoyable to listen to especially for instrumental and vocal performances. The speakers has a sensitivity of 89dB with a 5-1/4” dynamic balance polymer composite woofer with rubber surround and ¾” dynamic balance silk polymer tweeter. It supports Dolby and DTS, and can form part of your home theater system as frontal or dialogue speakers. The sound quality on the T15 is very clear and well-defined, with nice separation and soundstage that really immerses you into the music. That being said, our only quibble with the Polk audio T15 is that it lacks bass response – this can be easily supplemented with a dedicated subwoofer for a deeper low-end. The Polk Audio T15s have a very durable and sleek MDF cabinet design that blends in nicely into modern home décor. Overall, they are some of the best stereo speakers that provide really good sound quality and performance, and we highly recommend them. The JBL Arena B15 is one of the best stereo speakers with superb sound quality. It comes with a powerful 1 inch (25mm) soft dome tweeter which provides clean and crisp highs, together with a 5.5” (140mm) polycellulose woofer with room-filling sound performance. These speakers are capable of producing a tonne of volume output and fill up the entire room with rich and clear music for TVs and gaming. It comes ready with integrated wall-mount solutions for flexible installation and system configuration, and also works as a bookshelf or surround speaker in stereo or multi-channel systems. We liked the fact that the JBL Arena B15 has a wide frequency ranging from 100Hz to 40kHz, and a sensitivity of 86dB. It also features a contemporary all black cabinet shape and all black grilles which provide a sophisticated, modern look. 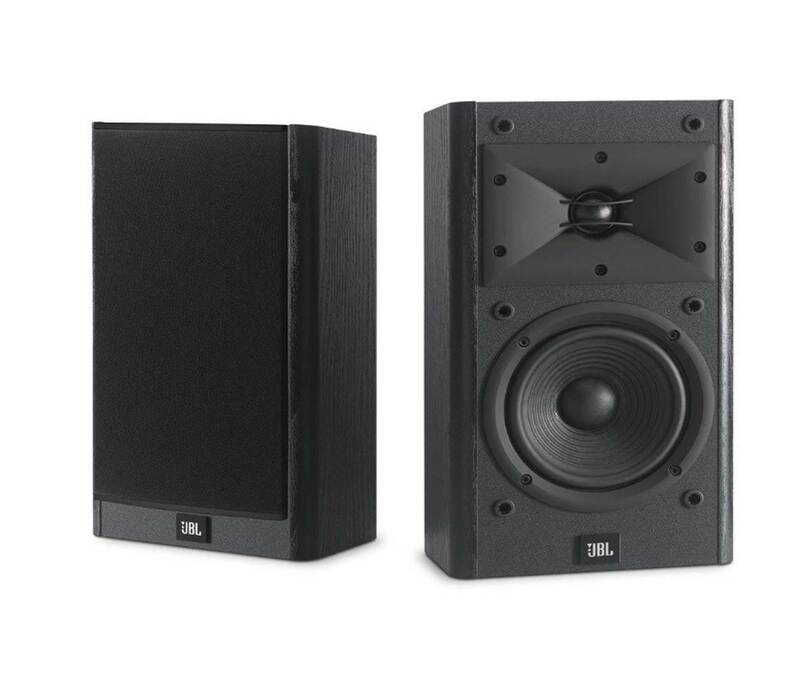 On the whole, the JBL Arena B15 is one of the best stereo speakers that offer a great combination of sound quality and design with integrated wall-mounts. The Verdict? The JBL Arena B15 are some of the best stereo speakers with crystal clear vocal reproduction and good soundstage. The tweeters deliver clean powerful highs with great attention to detail. While the midrange sound on the B15s is enhanced by the 5.5” woofers, these speakers have a shallow cabinet which reduces the overall bass reproduction and would definitely benefit from the addition of a dedicated subwoofer. We liked the fact that the JBL Arena B15 have integrated wall mounts which make them easy to mount on the wall and fit into an integrated home theater system. We liked the fact that the B15 speakers are housed in durable MDF cabinets and have a sleek and modern looking design. It also weighs around 17lbs per piece which is not too heavy to be placed on bookshelves. On the whole, the JBL Arena B15 is one of the best stereo speakers that deliver crystal clear sound performance and clarity, and we highly recommend them. The Bose 161 are some of the best stereo speakers that deliver rich and full sound performance. These speakers are designed to deliver balanced, spacious sound with Bose Stereo Everywhere technology, and provide good versatility for music and movies. The sound performance of the Bose 161 rivals that of larger stereo speakers, and is designed to blend in seamlessly with the Bose VCS-10 and any other Direct/Reflecting Bose Speaker System. The Bose 161 uses Articulated Array drivers positioning the Stereo Everywhere technology to deliver balanced sound throughout the listening area unlike other conventional speakers that radiate sound in a single direction. It comes with a 2.5-inch proprietary tweeter driver that delivers crisp highs and detailed vocal performances. The Bose 161 has custom mounting brackets included for flexible application and easy installation. We liked the fact that the speakers are magnetically shielded as well, which allows it to be placed near your TV or audio cables without any static interference. It’s protected against being overdriven as well with the automatic protection circuitry. Overall, the Bose 161 are impressive and one of the best stereo speakers you can find that provides decent sound quality without any distortion. The Bose 161 speaker delivers dynamic and balanced sound quality which makes your home theater experience even more enjoyable, whether you’re playing music or movies. It features Bose signature Stereo Everywhere Technology that helps to project sound throughout your listening area and enhance the sound dispersion from the speakers in an open environment. The 2.5” tweeter driver is designed to move more air from the small enclosures compared to similar size conventional drivers, creating a soundstage that rivals that of higher end stereo systems. While these speakers are capable of producing crystal clear highs and detailed midrange, we found that they are somewhat lacking in bass response and will definitely benefit from the addition of a dedicated subwoofer. The Bose 161 pumps out rich and great sound, filling out a medium sized room easily and makes for a great addition to existing home theater setups as front or rear speakers. We liked the fact that these speakers integrate well with the BOSE VCS-10 and other Direct/Reflecting Bose speaker systems, which provides more options for a convenient speaker setup. 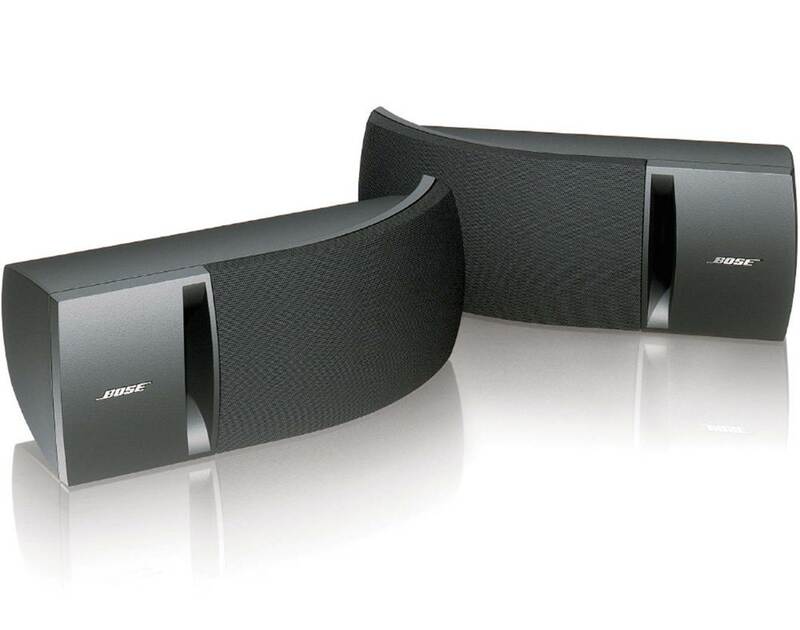 The Bose 161 has a modern and sleek design. They come with a discreet appearance and blend in nicely with modern home interior decor. The speakers are magnetically shielded which means that they can be placed near audio cables or TV devices without causing any static interference. The Bose 161 speakers come with a modern black design or a white variant for modern interiors. 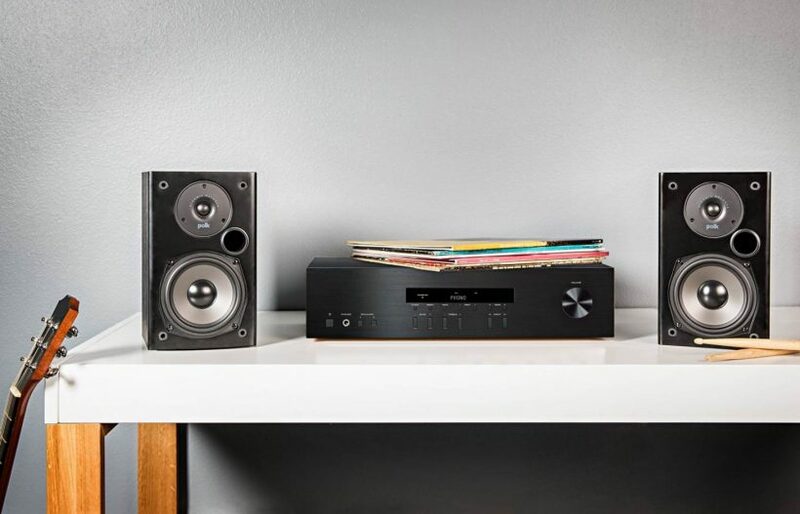 The design of the Bose 161 speakers make them very versatile – they can be placed on bookshelves, tables or integrated with custom brackets to mount it onto the wall. It can be mounted vertically or horizontally depending on your preferences. The Bose 161 speakers are well protected against overdriving with an Automatic circuitry protection. For best sound performance, we would recommend using proper wire gauge to run the distance between the amplifier and your speakers – the longer the distance, the lower the gauge you need to use. The Verdict? The Bose 161 speaker system is among the best stereo speakers that has great sound, rich highs and a vibrant midrange tone. The sound quality from the Bose 161 speakers rivals that of larger stereo speakers and can produce a good amount of volume without any distortion. The Bose 161 uses a proprietary 2.5mm tweeter that provides crisp highs and detailed vocal performances which provide good sound quality throughout music performances. It also features Stereo Everywhere technology which helps to disperse the sound widely instead of projecting the sound in a single direction. We liked the fact that the speakers are magnetically shielded which allows you to place them in close proximity to your TV or audio wires. It also comes custom brackets for easy installation and flexible placement. If you are looking for one of the best stereo speakers for use in bookshelf or wall-mount applications, we highly recommend the Bose 161 speakers. 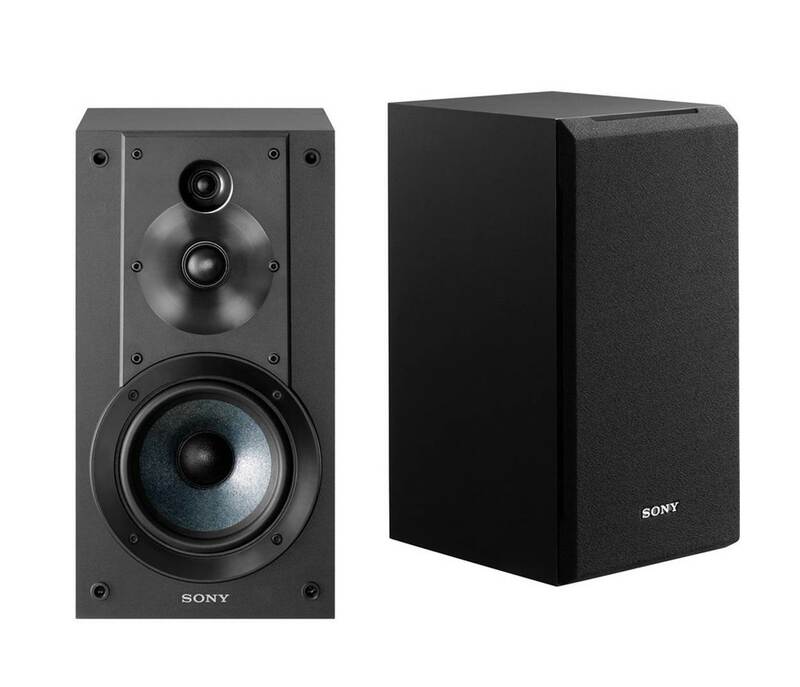 The Sony SSCS5 are some of the best stereo speakers consisting of a 3-Way 3-speaker bass-reflex system, 5-¼” Foamed-Mica Cellular Reinforced Woofer with a 1” Polyester Main Tweeter. The SSCS5 has a 6 ohm impedance and delivers immersive sound staging with the ¾” Sony Super Tweeter with sound reproduction up to 50kHz for high resolution audio. These speakers are versatile enough to deliver a vibrant sound experience with a wide soundstage that allows you to experience music exactly as the artist intended it to be heard. The SSCS5 provides natural depth and natural tonal clarity with an emphasis on the highs and vocals. The 3-Driver bookshelf speakers include a rigid 5.12 in MRC woofer for dynamic bass, with a 0.98 tweeter and 0.75 in super-tweeter designed to reproduce High-Resolution Audio Tracks. The Main tweeter features a polyester fiber for a more faithful, authentic sound. The speaker produces decent bass and mid-range frequencies due to the utilization of foamed mica-cellular diaphragm. The edge diffraction is suppressed for a clear and natural soundstage thanks to a slightly tapered faceplate. Overall, the Sony SSCS5 are some of the best stereo speakers that provides great sound quality and deliver good value for money. The SSCS5 stereo speakers deliver immersive audio, with crisp highs and a great attention to vocals and dialog in the mid-range, with a rich fullness in the low end frequency ranges. We also liked the fact that the SSCS5 stereo speakers deliver pretty deep bass with the 5.12” woofer and a foamed mica-cellular diaphragm. The tweeters are capable of producing natural details with high-resolution audio performance which adds a sense of spaciousness and detail to the music. We liked the fact that you can crank up the volume on the SSCS5 stereo speakers up to maximum and it can fill up a large room with rich sound without any noticeable distortion. Instrumental performances sounded crisp and lifelike with plenty of soundstage – you can notice the detailed separation in the music notes and the direction in which the sound is coming from. The 0.98 in soft dome main tweeter cuts out rear sound pressure thanks to the polyester fiber which also helps to produce a more faithful, authentic sound. The Sony SSCS5 has a sleek and unique design that blends in into modern home interior décor. It comes with tapered faceplate edges to supress sound diffraction for clear and natural sound performance. The speakers are compact enough for you to place them on a bookshelf or on the table; it can also be integrated into home theater systems as front dialogue speakers. The Sony SSCS5 has an optimized crossover component system for clear audio path and has a maximum input power of 100W for high quality audio performance. In terms of design, it’s difficult to go wrong with the Sony SSCS5 stereo speakers. The Verdict? The Sony SSCS5 is one of the best stereo speakers that provide an immersive audio experience with crisp highs and great attention to detail. Vocal performances and movie dialogue sounded crystal clear on these speakers and it provides a level of stereo separation and detail that makes them very enjoyable to listen to. It also comes with a mica cellular reinforced woofer that reproduces lower-midrange frequencies relatively well. We liked the fact that you crank up the volume on the Sony SSCS5 speakers and it can comfortably fill up a large room with vibrant and rich sound performance without any distortion. The design of the Sony SSCS5 speakers is durable and well-thought out – it has a tapered faceplate edge to ensure that sound diffraction is suppressed for clear and natural sound reproduction. The audio quality that you get with the Sony SSCS5 speakers is comparable with higher-end speakers and they can also be integrated into a home theater system for clearer sound and dialogue. Overall, the Sony SSCS5 is one of the best stereo speakers developed for crystal clear and vibrant sound and we highly recommend them. 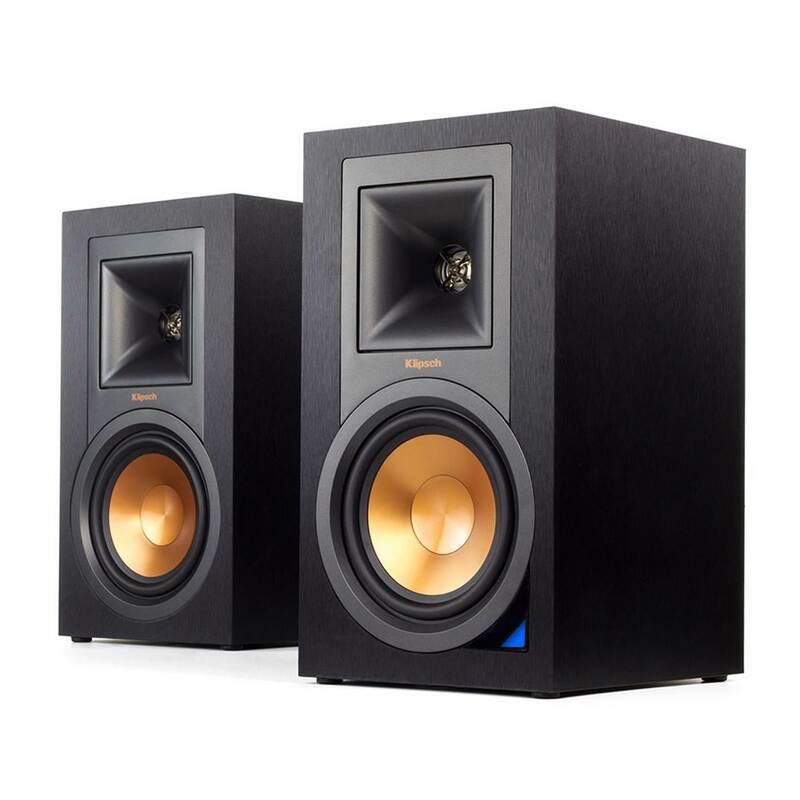 The Klipsch R-15M are some of the best stereo speakers that provide good power and performance in a small package. These speakers feature dual 5.25” copper-Spun high-output IMG woofers for natural sound reproduction and a brushed black polymer vaneer cabinet. They are ideal for small or medium sized rooms where they can deliver vibrant sound performance with good volume output. The R-15M speakers come equipped with a 90×90 Tractrix Horn with an aluminium tweeter that delivers crisp highs and good sound extension. We liked how natural and clear the sound from the R-15M speakers sounded. It also comes with a Linear Travel Suspension (LTS) tweeter which minimizes distortion for enhanced, detailed performance while the copper spun molded Graphite woofer provides low frequency response with minimal cone breakup and distortion. Overall, the Klipsch R-15M are some of the best stereo speakers that are designed for high performance audio and are worth checking out. The Klipsch R-15M provides balanced and smooth sound performance with great attention to detail. They will take some time to break into, but when they open up, the highs and lower-frequency range sounds very smooth and well-defined for a 5.25” driver. We also liked the soundstage produced by the R-15M speakers which allow you to distinguish clearly between the right and left speaker channels. Music soundtracks sounded very clear with a surprising amount of detail – you may even pick up details in the music which you have not noticed before. Disco and pop music sounded punchy and vibrant with crystal clear vocal performances and decent bass response. They are also great for musicians who want to listen to music in its pure form without any artificial enhancements. We would describe the sound signature of the Klipsch R-15M as more analytical in nature with a good emphasis on the highs and midrange tones. They can also produce a good deal of volume – enough to fill up a medium sized room with sound – which is pretty decent considering the size of these speakers. The Klipsch R-15M features a brushed black polymer Veneer cabinet that provides an aesthetically pleasuring and discreet look for the Klipsch R-15M. It also features a rear-firing port that is matched to the cabinet and speaker drivers for clear sound performance. It comes with a 90×90 Tractrix Horn that provides clean and natural sound performance. The Injection Molded Graphite woofers are designed to be light and rigid, and minimize cone breakup and distortion. The speaker itself is compact enough to work as bookshelf speakers or be placed on a desktop. The R-15M speakers can also integrate well into home theater systems as front speakers for crystal clear dialogue performance. They are relatively compact and unobtrusive, and blend in nicely into modern home interior décor. The Verdict? The Klipsch R-15M are some of the best stereo speakers designed to deliver natural and clear sound. They pack plenty of power and versatility in a small package, and can also double as bookshelf speakers or as left, center or right speakers in a home theater system. They come with dual 5.25” copper-spun high-output IMG woofers for crystal clear vocals and feature a rear-firing port that is matched to the cabinet and acoustic drivers. The sound performance on the R-15M speakers is balanced, and brings out the details in the music really well. The bass performance on the R-15M speakers is decent and punchy, although it would definitely benefit from the addition of a subwoofer. The speakers come with a brushed black polymer veneer cabinet finish that looks very sleek and modern, and blends in nicely with modern home interior décor. If you are looking for one of the best stereo speakers that can produce high-fidelity sound performance we good attention to detail, the Klipsch R-15M speakers come highly recommended. The Acoustic Audio AA321B are some of the best stereo speakers that can deliver full-range sound with a wide frequency range between 150 Hz to 20 kHz. The speakers are capable of producing plenty of volume and have an efficiency rating of 88dB and an impedance of 8ohm. It comes equipped with 2.5″ polypropylene full range woofers that provides punchy lows and clean sound reproduction. It also comes with mounting brackets and a quick release spring loaded wire terminal for easy installation. The heavy duty ABS construction sealed cabinets make the speakers feel compact, durable and long-lasting. The simple and smooth design allows you to integrate the speaker into home theater or surround sound systems as front or side firing speakers. It is also compact enough to blend into smaller areas and be used as bookshelf speakers – it has a dimension of 3.5” x 3.5” x 4.5”. The manufacturers also provide full instructions to install and position the speakers which is a nice added touch. Overall, the Acoutic Audio AA321B are some of the best stereo speakers designed for those who want compact speakers with good quality sound performance and we highly recommend them. 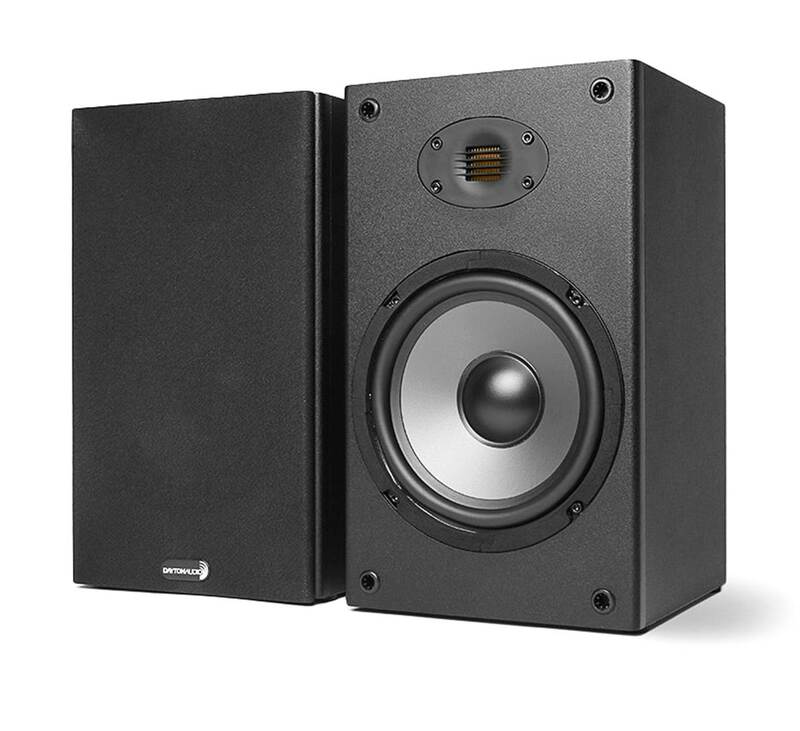 The Acoustic Audio AA321B provide clean sound performance with vibrant midranges and are a great choice for surround sound/side surround speakers. They work especially well with ATMOS-encoded video to produce stereo sound with good soundstage and separation. These speakers are capable of producing balanced sound performance with crisp vocals and good tonal ranges. They work great as standalone stereo speakers and are suited for smaller rooms or spaces. They also work great as left and right speaker surrounds, especially with ATMOS system enabled. While the AA321B speakers can produce good volume, they may not be able to fill up larger rooms due to their size limitations. That being said, the level of sound clarity and smoothness is pretty decent for their size. We would also recommend adding a dedicated subwoofer to the system for deeper bass reproduction. With the spring loaded wire terminals, the AA321B speakers are ready to be integrated into surround sound or home theater systems straight out of the box. 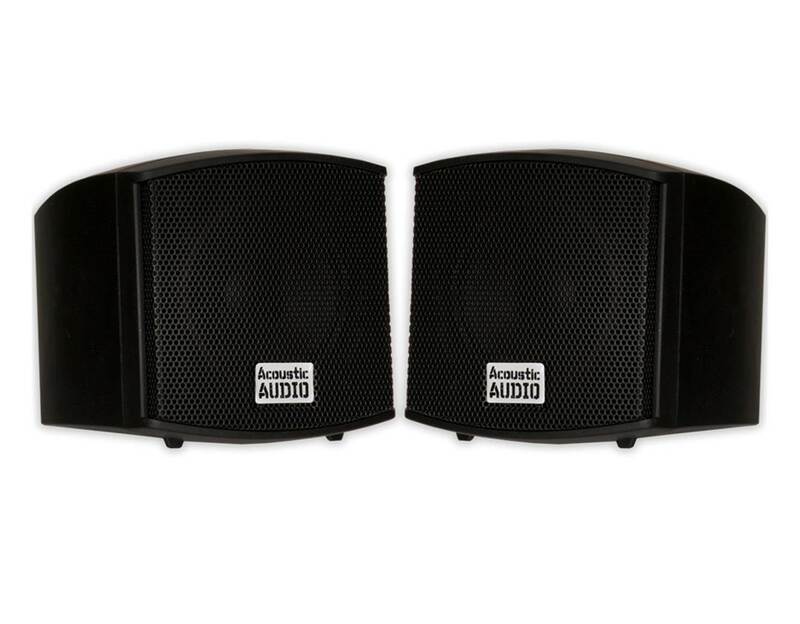 The Acoustic Audio AA321B has a durable and efficient design. They are compact and small enough to be placed on bookshelves or table-tops, or be used as side firing speakers in a 5.1 or 7.1 home theater setup. 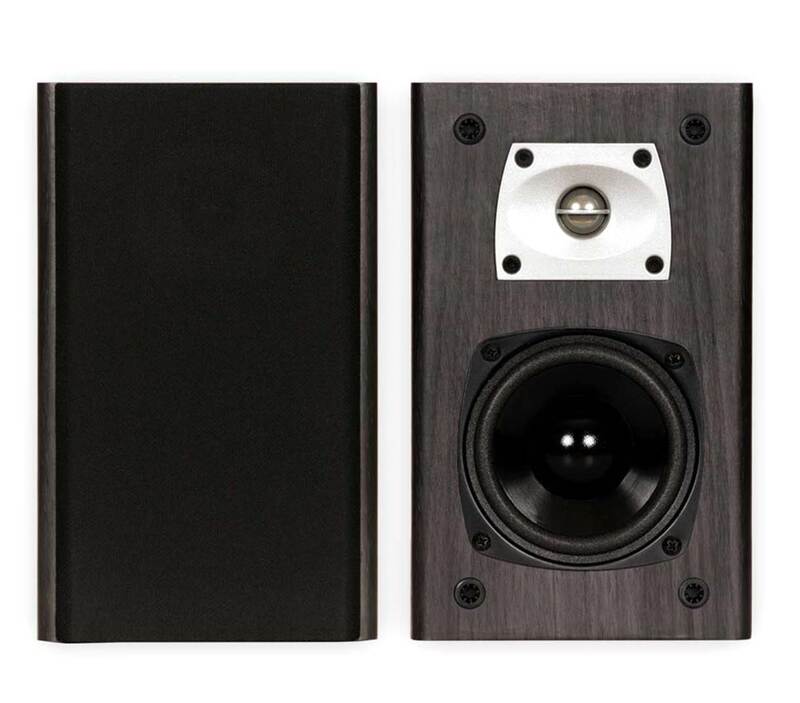 We liked the fact that the AA321B speakers come with a swivel attachment and 4 wall screws to mount to any wall. These speakers have a recommended power rating between 20 to 400 watts and can be easily hooked up to any amplifier. It also comes with 2.5” polypropylene full-range woofers, mounting brackets and a heavy duty ABS construction-sealed cabinet. The speakers are designed to be small and compact with a dimension of only 3.5” x 3.5” x 4.5”. They blend into modern home décor easily without any issues and have the ideal size for easy speaker positioning. The Verdict? The Acoustic Audio AA321Bs are some of the best stereo speakers that feature a small and compact design with balanced sound. It comes with a rigid and heavy duty ABS construction that makes it feel strong and compact and can be positioned easily within a home theater setup or on bookshelves. It also comes with spring loaded terminals for easy installation and connectivity to sound amplifiers. They are great as left and right speaker channels in a surround sound setup, and have enough volume to fill up a medium sized room without any distortion. The sound quality from the AA321Bs is crystal clear, with crisp highs, detailed midranges and smooth vocal reproduction. We did not hear any harshness or sibilance despite the small size of these speakers. It also has a relatively wide frequency range and can reproduce the entire audio spectrum pretty well, although it would definitely benefit from a dedicated subwoofer for deeper extended lows. Overall, the Acoustic Audio AA321Bs are some of the best stereo speakers available for compact home audio setups and we highly recommend them. The Pioneer SP-BS22-LR is one of the best stereo speakers that can produce 80 watts of power and has a nominal impedance of 6 ohms. It comes with a 4 inch structured surface woofer with oversized magnets and vented pole piece for improved bass response, and a 1 inch high efficiency soft dome tweeter for smooth high frequency reproduction at high volume levels. These stereo speakers also come with a built-in 6 element complex crossover which blends the audio between the woofer and tweeter for greater accuracy and detailed sound reproduction. The SP-BS22LR comes in an RF Molded Curved cabinet to reduce internal standing waves and sound distortion. They are speakers that can produce very crisp sound quality with clear details and a wide frequency response, and can be used as standalone stereo speakers or complement a full surround sound setup. Overall, the Pioneer SP-BS22LR is one of the best stereo speakers available, so don’t forget to check them out! The Pioneer SP-BS22-LR delivers crystal clear stereo sound with full-range mid-tones and crystal clear vocals. The sound profile is great for entry level home theater, with balanced sounds and a decent bass response that adds a layer of punch to music performances. These speakers require some breaking in but will sound great once they’ve been given time. Instrumental music performances sounded very crisp and lifelike with great attention to detail, and the level of stereo separation that you get with these speakers is very good. The sound details between the right and left channels are well-defined, and you get a pretty good sense of where each note is coming from. The separation between the speakers is distinct and clear – vocal performances sounded refined and smooth with spatial imaging. The Pioneer SP-BS22-LR speakers have enough volume to fill up a medium sized room with rich and filling sound. They also work very well when integrated in a surround sound system as front dialogue speakers. The Pioneer SP-BS22-LR has a very sleek and modern looking design that can blend in easily on bookshelves or desktops. They are compact enough to be placed on bookshelves without occupying too much space and look unobtrusive. It has an 80 watt power handling rating with a nominal impedance of 6ohms. It comes with RF Molded Curved Cabinets to reduce internal standing waves, and features a 4 inch structured surface woofer with oversized magnets and vented pole piece for improved bass response. We liked the overall design of these stereo speakers and how nicely it bends into modern home décor with a sleek wood-grain finish. The Verdict? The Pioneer SP-BS22-LR is one of the best stereo speakers you can find for entry-level home audio systems. They are nice speakers to have to supplement your home theater systems or surround sound setup as frontal dialogue speakers or side firing speakers. The SP-BS22-LR provides balanced sound performance and delivers decent bass response for its size. It requires some hours for breaking in, but once it’s ready it will fill up your room with rich and filing sound. We liked the fact that these stereo speakers come with a 6 element complex crossover that blends the woofer and tweeter together for greater accuracy. It has a power handling of 80 watts and a nominal impedance of 6 ohms, and can produce a tonne of volume without any distortion. The sound performance on the Pioneer speakers is crisp and detailed, and we thoroughly enjoyed listening to musical and vocal performances on these speakers. The speakers are also well-designed with RF molded curved cabinets that blend into modern home interior. If you are looking for one of the best stereo speakers that are simple and compact with plenty of power, the Pioneer SP-BS22LR comes highly recommended. The Sound Appeal 6.5” speakers are some of the best stereo speakers designed for high quality music performance. The speaker is made of high-quality components coupled with a black wood grain cabinet which allow these stereo speakers to perform on par with higher end stereo setups. The speaker comes equipped with refine silk dome tweeters for crisp highs and clear vocals, and 6.5” polypropylene woofers with a custom tuned bass reflex port that can provide really good bass response and deep punchy lows. The Sound Appeal speakers are designed to be compact with a dimension of 12” x 7.75” x 7.5” and can be wall-mounted. These speakers have removable grills, so you can show off the beautiful design of the tweeter and tuned port. It has an impedance of 8 Ohms, 80 Watts RMS power handling and a 45Hz to 22kHz Frequency response. If you are looking for one of the best stereo speakers that can pump out distinctly clear stereo performance, the Sound Appeal 6.5” speakers are a great choice. The sound quality on the Sound Appeal 6.5” speakers is crisp and very clear, with great attention to detail. The speakers are capable of providing full-range sound with crisp highs and detailed midranges. The silk dome tweeters and bass reflex port helps to emphasize the highs and mid-range frequency ranges which adds an extra punch to bass-heavy music genres. Vocals are natural and smooth, and have plenty of mid-bass response. Classical music genres and instrumental notes sounded vibrant and well-defined, and we liked the fact that the speakers provide a good deal of stereo separation as well. The Sound Appeal speakers have a 12db per octave crossover for much smoother response between the tweeter and woofer network. They also work great for music recording sessions and are capable of producing music exactly as the artist intended it to be heard. It has a very wide frequency response between 45 Hz to 22kHz and can deliver great volume without any distortion. 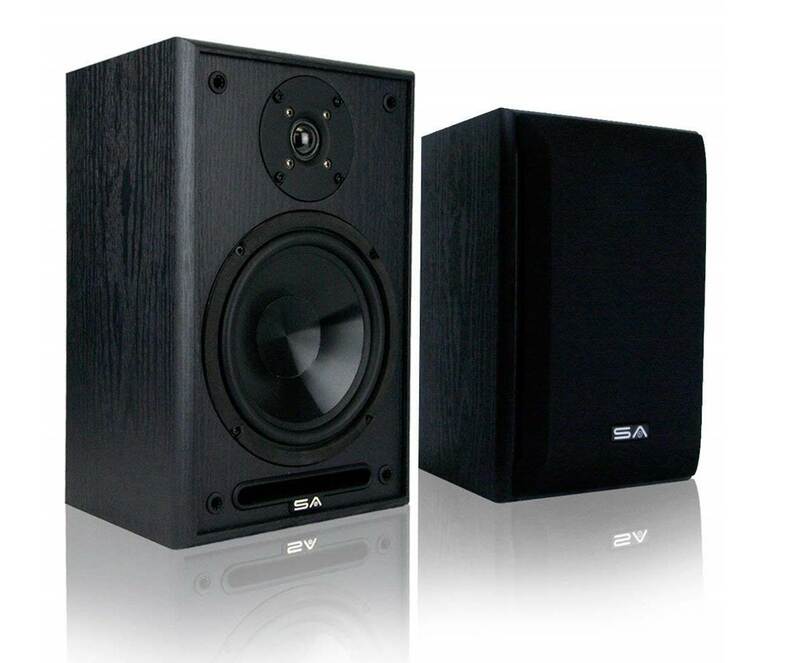 The Sound Appeal 6.5” speakers have an elegant and modern design with full MDF cabinets with a black wood grain design. The cabinet is designed to be relatively compact and has a dimension of 12” x 7.75” x 7.5” and can also be mounted on the wall or integrated into a home theater system setup. It also comes with an included eye hook which is pre-drilled to accept Aeon speaker mounts. The speakers come with refined silk dome tweeters and 6.5” polypropylene woofers and a custom tuned bass reflex port for deeper sound reproduction. It has a power rating of 80 watts RMS and they can produce enough volume to fill up a large room with rich and vibrant sound without any distortion. The speakers also have a front-facing bass reflex port which makes them ideal for mounting flush against a wall. They work well as frontal or rear speakers in a surround sound speaker setup and are very easy to hook up with an integrated amplifier or home theater system. The Verdict? The Sound Appeal 6.5” speakers are some of the best stereo speakers you can find that delivers full-range sound quality. They can be used as bookshelf speakers or integrated in a surround sound speaker setup for full-range audio reproduction. The sound quality on these speakers is very crisp, with nice stereo sound reproduction, clean vocals and very detailed soundstage. Vocal performances sound very natural and well-defined, and the level of soundstage that you get with these speakers is pretty good. You can tell where each individual note is coming from and the direction of the sound from both sides. The Sound Appeal speakers are made with high-quality components and have a black wood grain cabinet finish that blends in nicely with modern interior décor. The speaker comes with refined silk dome tweeters and polypropylene woofers with a custom tuned bass reflex port. It can also be mounted on the wall for easy installation. The speakers have an impedance of 8 ohms and a power handling of 80 watts RMS which allow them to be connected to most audio amplifiers. Overall, it’s one of the best stereo speakers that delivers good value for money and are definitely worth checking out. The Dayton Audio B652 are some of the best stereo speakers that deliver authentic sound in a small package. They are essentially 6-½-Inch 2-way bookshelf speakers that can deliver crystal clear audio performance and plenty of volume for its size. The B652 are quality speakers that feature a black ebony pica vinyl cabinet finish with removable grilles. These small and compact speakers are capable of delivering excellent clarity and detail, and have a wide frequency range from 70 to 20,000Hz. The design includes quick connect speaker terminals and a key-hole hanger with two 9-1/2Foot long 20 AWG Speaker cables for easy installation. They work great as standalone speakers for a home audio system and can also be used as front or rear speakers for surround sound setups. Overall, the Dayton Audio B652s are some of the best stereo speakers that are compact and portable with crystal clear sound performance. The Dayton Audio B652 has very good sound quality and produces a surprising amount of bass considering its compact size. The speakers are capable of delivering crisp highs with detailed midranges and pretty good bass response that adds a layer of complexity to the music. We liked the fact that bass-heavy music genres such as electronic dance music and rock sounded vibrant and punchy through the B652 speakers. We would also recommend breaking in these speakers for a couple of hours for the sound to become more rounded and full. The level of soundstage that the Dayton Audio B652 delivers is really good, and makes you feel as though you are listening to a higher-end sound system. Orchestra and vocal performances sounded crisp and lifelike with great detail, and you get a good sense of where each individual note is originating from with the left and right speaker channels. The B652 speakers also pump out really good volume levels without any distortion, and work great as surround sound speakers for a full home theater experience. In terms of sound quality, we would say that the Dayton Audio B652 delivers more volume and bass than expected from a set of stereo speakers. The Dayton Audio B652 speakers have a very sleek and modern looking experience that blends in nicely into modern home interior décor. It features a black ebony pica vinyl cabinet finish which gives it a modern aesthetic. The speaker also comes with a removable grill which exposes the main tweeter drivers if necessary. The speaker itself is relatively small and compact, and can fit onto most bookshelves without any issues. It can also be used as front dialogue speakers for home theater, or as rear speakers in a full surround sound setup. The sound projection from the B652 speakers is very good and it can easily fill up a large room with crisp sound quality. We thoroughly enjoyed testing the B652 speakers and they are very easy to hook up and install as well. The Verdict? The Dayton Audio B652 are some of the best stereo speakers you can find that delivers powerful and crisp sound performance in a small package. The speakers are very well-designed and have a black ebony pica vinyl cabinet finish which blends in nicely into modern home interiors. It also delivers good sound quality with nice treble ranges, clean midrange tones and a surprising amount of bass. Music genres such as country folk and orchestra performances sounded very detailed and clear with spaciousness and soundstage. It also has a removable grill which exposes the speaker drivers depending on your preferences. The speakers can also produce enough volume to fill up a large room with rich and filling sound with good clarity and with minimal distortion. If you are looking for one of the best stereo speakers that are easy to setup and are fuss-free, the Dayton Audio B652 comes highly recommended. The Theater Solutions B1 speakers are some of the best stereo speakers with an efficient 2-way design and functionality. They have a recommend power of 10 to 200 watts per speaker and have a wide frequency response between 45 Hz to 22 kHz with an efficiency of 89dB. The speakers also have an impedance of 8 ohms as per usual stereo speakers. The B1 speakers have a 2-way design with bi-laminate composite balanced shielded woofers and ferro-fluid cooled titanium tweeters for crisp highs and vocal reproduction. It also has a 2200Hz crossover frequency for smooth sound between the tweeters and woofers. The B1 speaker comes with rear port vents in a non-resonant MDF enclosure with an aesthetically appealing wood grain finish and detachable black fabric grills. The speakers are relatively compact and have a dimension of 9.5” x 5.8” x 6.25” and come with spring loaded raw wire connections for easy setup. They can be used for center channel, surround sound or home theater systems and comes as a pair of speakers. If you are looking for one of the best stereo speakers that can provide really clean and crisp audio for home listening, we highly recommend them Theater Solutions B1 speakers. The Theater Solutions B1 speakers are highly efficient and can produce crystal clear music with full-range tonal clarity. The speakers have a frequency response between 45 Hz to 22 kHz and can reproduce practically the entire audio spectrum really well. The highs and midranges are crisp and clear, and the bass output from these speakers is decent and punchy. We liked how clear vocal performances and dialogue sounded through these speakers – it feels like listening to high-end home theater speakers with very crisp details. We liked the fact that you can crank up the volume on the Theater Solutions B1 speakers with practically no distortion – we would recommend an amplifier with at least 100 watts RMS for the best sound output. The B1 speakers are equipped with a 2,200 Hz crossover frequency which helps to smoothen out the music ranges and create balance between the highs and midranges. Instrumental music sounded particularly good with these speakers, and the level and detail in each musical note is reproduced with distinct accuracy. In terms of sound performance, we would describe the Theater Solutions B1 speakers as having the most accurate sound as compared to other similar stereo speakers. The Theater Solutions B1 speakers have a sleek and modern looking design – it has a 2-way design and functionality with bi-laminate composite and balanced shielded woofers. 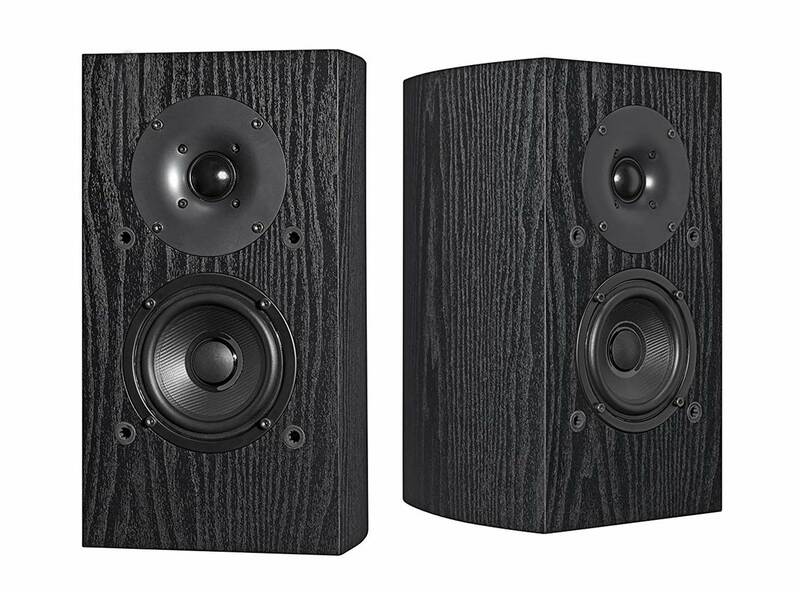 It comes with non-resonant MDF enclosure with a black wood grain finish. The speaker has a dimension of 9.5” x 5.8” x 6.25” and can be easily hooked up to home theater or surround sound setups. For best sound performance, we would recommend using an amplifier with at least 100 watts RMS of power to handle these stereo speakers. The B1 speakers also have an efficiency of 89dB and a frequency response of 45 Hz to 22 kHz and an impedance of 8 ohms. They integrate really well with home theater and surround sound setups and are best suited as frontal stereo speakers for dialogue and crystal clear audio performance. The Verdict? The Theater Solutions B1 are some of the best stereo speakers you can find with full-range sound quality and wide frequency response. They are essentially 2-way bookshelf speakers that can produce clean audio performance with an efficiency of 89dB and wide frequency response. It comes with composite woofers and titanium dome tweeters for crystal clear highs and midrange reproduction, which adds a layer of sparkle to the overall music quality. We also liked the fact that these speakers can produce enough volume to fill up a large room with rich sound. It comes with a solid MDF enclosure that helps to reduce resonance and is relatively compact, which makes it easy to be used as bookshelf speakers or integrated in a home theater setup. For the best sound performance we would recommend using an amplifier with at least 100 watts of power to drive the B1 speakers. If you are looking for some of the best stereo speakers that can provide sound performance above your expectations, the Theater Solutions B1 speakers are a great choice.